These are samples of previously published Rossica journals! 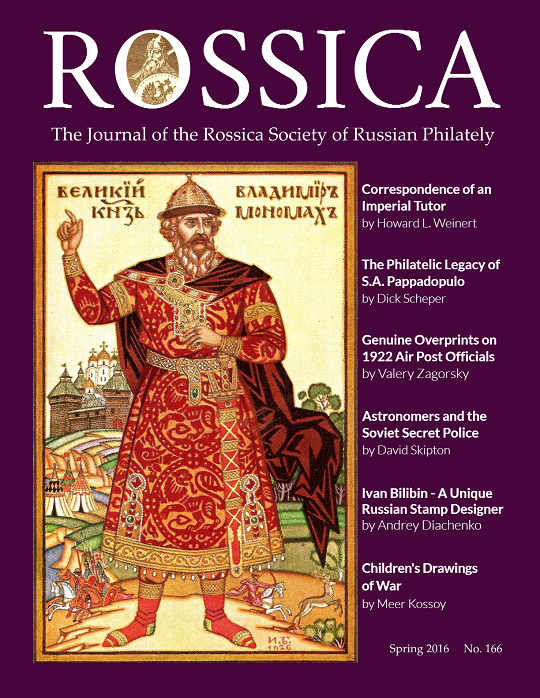 The Rossica Society publishes two journals per year, the first in the Spring and the next in the Fall. 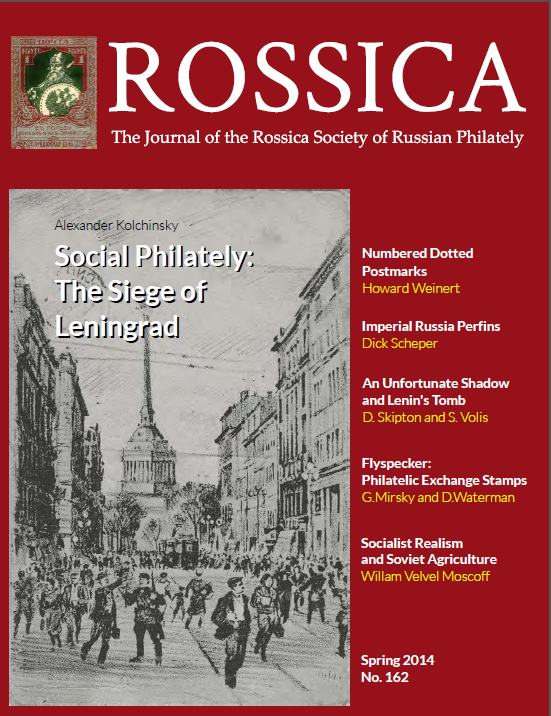 The journal consists of scholarly articles focused on all aspects of Russian philately that may include information on the pre-stamp days of Russia, Imperial postage, prison mail, World War correspondence, or the postage of post-Soviet states. The fascinating and sometimes incredibly confusing history of Russia, the Soviet Union, and post-Soviet states make our hobby a most interesting one! Previous Editions of the Rossica Journal issues 44 - 168, are available in various formats for purchase. Remaining printed issues can be purchased for $15.00 + postage (Members) and $18.00 + postage (Non-members) while supplies last. We also provide single issues as a download for a reduced price of $5.00 (Members) or $8.00 (Non-members). Please contact the Rossica Society Treasurer if you are interested in purchasing paper or electonic copies of single back issues. The Rossica Society is pleased to offer Rossica Journals 1 - 43, in Russian, on a single DVD. Issues 44 - 161 are also available on a single CD ROM. Please see the Bookshop for more details. 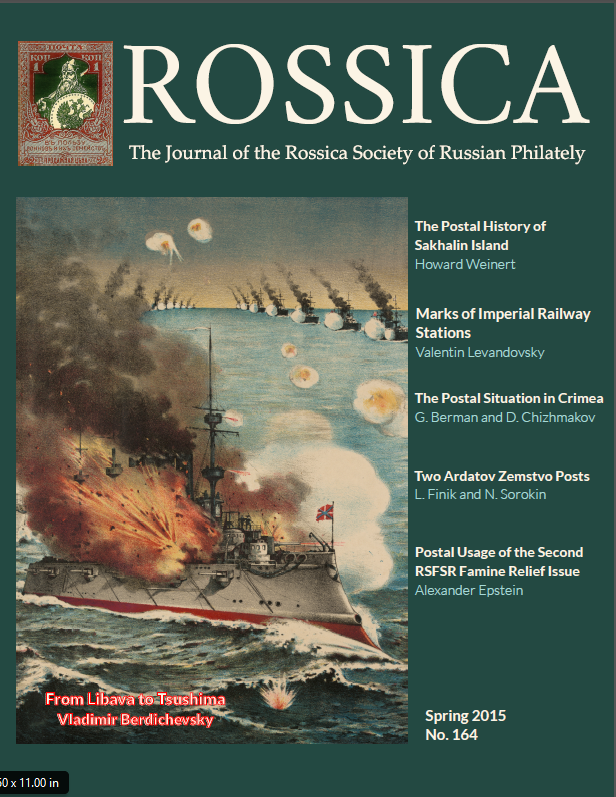 The Rossica Journal editor is Nik Sorokin, Editor. Postcards of the New Root Hermitage in Mahopac, N.Y. Postal Markings of the Type "Taken From the Postbox"